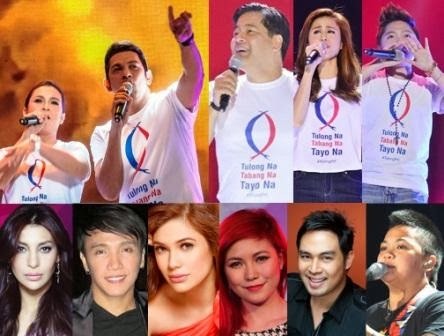 Kapamilya Stars Unite for a Star-Studded Solidarity Concert for the Victims of Calamity! 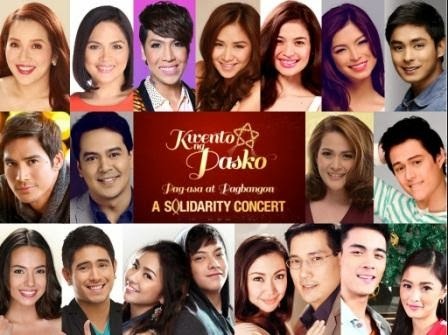 More than 100 of the biggest and brightest personalities in the country will unite for a meaningful Christmas celebration via ABS-CBN’s Solidarity Concert titled “Kwento ng Pasko, Pag-asa at Pagbangon: The 2013 ABS-CBN Christmas Special” to be held on Tuesday (December 10) at Smart-Araneta Coliseum, Quezon City. Similar to the sold-out “ABS-CBN Presents: Tulong Na, Tabang Na, Tayo Na! An All-Star Benefit Concert" last November, the proceeds of the ‘Kwento ng Pasko’ Solidarity Concert will be donated to go to the Sagip Kapamilya Calamity Fund of ABS-CBN Lingkod Kapamilya Foundation that continues to help rebuilding the lives of survivors from various calamity-stricken areas in the country. Continue to take part in rebuilding lives of Kapamilyas affected by calamities by wearing "Tulong Shirts" which are still available through authorized dealers nationwide. For more details, please visit ABS-CBNnews.com/TulongPH. Everyone is encouraged to send their messages of hope for the calamity survivors. Simply take a picture of you holding your personal message wearing the “Tulong Shirt” and post it on Facebook, Twitter and Instagram with the hashtag.